This is my answer - or the beginnings of one - to the "guy has umpteen wives" trope. Sefton was beyond nervous as his parents led him down the path to his bride, but he kept his chin up and smiled as if this was the best idea in the world. Taisiya of Stonewall had three husbands already and six children, the oldest of which had been in classes with Sefton. At least he wouldn't have to look Isham in the eye; he'd been part of the three-way trade that had ended up with Sefton bare-footed in the grass and Taisiya waiting at the pillar. His parents' hands were firm on his elbows, and behind him his mother's second and fourth husbands marched quietly. He could no more run away than if they had already put chains on him. But he would not. That would have been shameful and ridiculous, and, above all, it would have been futile. So he knelt at the appointed spot, his best outfit dampening with the dew still fresh on the grass. "Lady Taisiya. I come to you." Those were his only words. The rest came between the lady and his mother, with his father and his mother's other husbands saying only the few words they were needed for. Everyone understood that this was a contract. First marriages might be for love. Late-marriages, too, past the age of children or war. Sefton had never even met Taisiya before; there was nothing of love about this arrangement. This was for deals between houses and connections, for his mother’s fifth husband, for a trade arrangement that would strengthen the three houses involved and their constituencies against the  to the north and the  to the west. Sefton pressed his forehead to the ground and considered meditations on obedience. Sefton stole a final glance at his mother and father, at his second-father and fourth-father. Only Safion, for whom he’d been named, met his eyes. His second-father winked at him before lowering his own head, a playful smirk still dancing on his lips. It was far too late to back out, even if backing out had ever been an option. Sefton let his new wife lead him from the hilltop down into the waiting carriage. There was a kneeler inside the carriage, and a man he thought was probably Lady Taisiya’s second husband sitting in the driver’s seat. The Lady took her seat, and Sefton knelt by her side before he had to be told to. She said nothing to the driver, not he to her, but simply clucked to the horses. The carriage moved away from the boundary between Stonewall and Sefton’s home. He stared at the wooden floorboards, at the soft velvet edge of the kneeler, at his knees, barely hidden behind white linen. “Stonewall is not so far from your childhood home.” Her voice was soft. Sefton peeked up at her guiltily; had he spoken aloud? “I do my duty, mistress,” Sefton murmured. “Onter?” He had met Lady Taisiya’s husbands — in the marketplace, or running errands, and in the fields at harvest-time when everyone worked. “They don’t matter, though.” She’d hit too close to the mark, and he found himself sounding bitter. Sefton swallowed. “You… you care what makes me a person?” It seemed a foolish thing to say to his new wife, but he seemed to have forgotten all his manners. There was nothing to say to that, so Sefton waited, his eyes downcast and his neck pressed into his new wife’s hand. 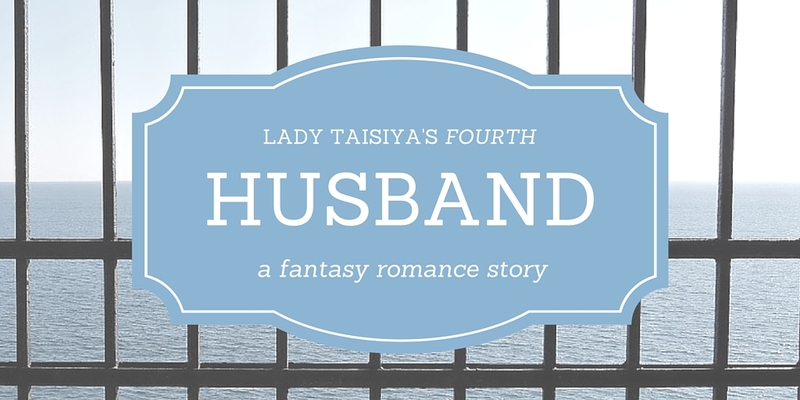 He would be a good husband… no matter what his parents had hidden from his new wife. Hmmm! A new variation, at least to me.